This month’s Teacher’s Corner explores the world of travel and tourism. Specifically, each week covers travel-related topics that students can use to practice speaking, reading, and listening. For many English learners, traveling the world is one of the many reasons they study English. No matter where you travel, it is easy to find a speaker of English to help you on your journey. However, as every good traveler knows, it is best to be prepared. This month’s Teacher’s Corner is devoted to giving students the chance to practice and prepare their English for the world of travel. Week 1 begins the month with a Pecha Kucha style presentation. In these fast-paced presentations, students must describe an around-the-world trip in three minutes using only six presentation slides. In Week 2, students practice common phrasal verbs used in travel and tourism. In Week 3, students describe the tourist attractions in their home countries by preparing a six-day trip for a new visitor. Finally, this month’s Teacher’s Corner concludes with a debate activity focused on the increasing concern of over-tourism. In this week’s Teacher’s Corner, students are tasked with creating a Pecha Kucha presentation on an around-the-world trip. Pecha Kucha is a presentation style where each presenter is allowed twenty slides which are shown for twenty seconds each. The goal is to encourage the speaker to be concise – to not talk too long. For this activity, students will get six slides shown for thirty seconds each, with each slide showcasing a place they would like to visit on a trip around the world. For this activity, students will be giving presentations to the class. To save time, be sure that students submit their presentations as a homework assignment before the day they will present them. The teacher should then have all the presentations loaded onto the class computer, ready to go at the start of the class. Having the presentations already loaded will save time, compared to each student separately loading his or her presentation on the computer. Having the presentations ready to go at the start of class will save time, compared to each student separately loading his or her presentation on the computer. If a computer is not available, this can be done on sheets of large paper as well. During this activity, students will be giving presentations that have a set time limit of three minutes. To keep students on time, the teacher controls when the slides of the presentation change. Optionally, a student can be selected as the official timekeeper. This student can sit at the presentation computer to advance the slides instead of the teacher. Begin the class by showing a map of the world. To warm students up for the activity, ask students to come to the board and point to countries that you name. Next, write the word continent on the board. Ask the class if anyone knows the meaning of the word continent. Give the students an opportunity to answer. To check the students’ comprehension of the word continent ask the class, “How many continents are there in the world?” Students should respond with “seven”; if they answer “six,” they may have forgotten about Antarctica! Ask the students which continent they most want to visit and why. Tell the students to think about their answers. Next, have the students form pairs and share their answers with their partners. Finally, have students share their answers with the entire class. Inform the class that for homework they are going to plan an around-the-world trip. Explain to the students that they will prepare a presentation to show the class about their around-the-world trip. Students can only visit one location per continent. Instruct the students that their one location per continent must be a city, national park, or sightseeing location. An entire country is too large to select as one location! Students must travel in one direction around the world (either east or west). Students should create a presentation of six slides, or one slide per location. Note: Even though there are seven continents students are only asked to visit six. This is to give them some choice in where they visit, but many may choose to skip Antarctica! Each slide should have some basic information about the location and at least one picture of the location. Finally, inform the students that they will only have three minutes to give their presentation to the class, and each slide will only be shown for thirty seconds. So, students should practice their presentations before class! On the day students give their class presentations, remind them they only have thirty seconds for each slide. If time permits, give the students a few minutes to check their notes and prepare for their presentations. Have the first student presenting come to the front of the class. Open the student’s presentation and start the timer. After thirty seconds move to the next slide; after another thirty seconds move to the third slide; and so on. Optional: After all the students have presented their around-the-world trip, have the class vote on the most interesting trip! This week’s Teacher’s Corner provides students with the opportunity to practice using phrasal verbs in an activity about New York City. Print out copies of the phrasal verb cards in Appendix 1.
a. Students will use the phrasal verb cards in a pair-work activity. Print enough copies of the phrasal verb cards for each pair of students to have a set. Cut out the phrasal verb cards and for each set, mix the cards so that the phrasal verbs and definitions are mixed well. Print out copies of the phrasal verbs fill-in-the-blank worksheet in Appendix 2. Students will use the worksheet in a pair-work activity. Print enough copies of the worksheet for each pair of students to have one. The answer key is in Appendix 3. Begin the class by having the students form pairs. Give each pair a set of phrasal verb cards (already mixed up) from Appendix 1. Have the students work together to match each phrasal verb to its correct definition. After the students have completed the matching activity, review the answers as a class. a. 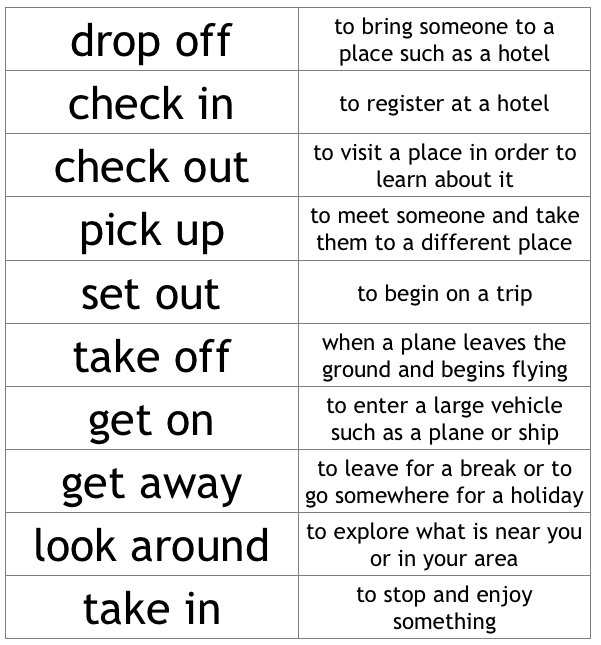 Answer: Each of the phrasal verbs is related to travel. a. Optional: Ask the students this question as part of a Think, Pair, Share activity. i. First, have the students think about their answer individually. ii. Next, have the students share their answer with their partner. iii. Finally, encourage the students to share their answer or, even better, to share their partners’ answers with the class. Begin this part of the activity by asking the students if they would like to visit New York City. Next, ask why they would like to visit the city, or ask what they would like to do if they visited the city. As students answer the questions, pass out the phrasal verb fill-in-the-blank worksheet to the pairs of students. Instruct them to read through the worksheet and circle any vocabulary they don’t know. a. If students have questions about vocabulary, take a few moments to answer their questions before moving on to Step 4. Next, have the pairs of students fill in the blanks on the worksheet with the phrasal verbs on the cards they used in Part 1 of this activity. As students work, walk around the room to check on their progress. Once the pairs have finished filling in the blanks, check their answers as a class. Directions: Read the paragraphs below about visiting New York City (NYC). Fill in the blanks with the correct phrasal verbs. You may need to change the verb tenses of the phrasal verbs. New York has been called “The City That Never Sleeps!” With so many things to do at any time of day, New York is a great place to visit on vacation. Thanks to New York’s many transportation options, you don’t need anyone to __________ you __________ at the airport. Instead, you can take a bus or the subway into the city, or even have one of the city’s famous yellow taxis __________ you _________ at your hotel. After you ___________________ to your hotel, you can ____________________ on your NYC adventure! If it is your first visit to New York, be sure to take some time to ____________________ the city by taking a walk. It can be a great way to get to know the city and experience the New York way of life. Some of the best things about New York can be found by ___________________ the many diverse neighborhoods full of great food, interesting events, and historical landmarks. Even though New York is famous for its busy streets, you can ___________________ from the crowds by visiting Central Park. There you can walk through the trees, sit by the lake, and even get a famous New York City hot dog. Of course, no trip to New York would be complete without visiting the Statue of Liberty. To visit, you need to ____________________ a ferry at Battery Park. While crossing the water, you can ____________________ a wonderful view of the city. Once on Liberty Island, you can walk around the statue, visit the museum, or climb the 377 steps to the top of the Statue of Liberty. It is an incredible experience, but tickets sell out quickly! As you leave New York and your plane ____________________, be sure to enjoy the view out the window to get one last look at the city that never sleeps! New York has been called “The City That Never Sleeps”! With so many things to do at any time of day, New York is a great place to visit on vacation. Thanks to New York’s many transportation options, you don’t need anyone to ____pick you up_____ at the airport. Instead, you can take a bus or subway into the city, or even have one of the city’s famous yellow taxis ______drop you off________ at your hotel. After you _____check in________ to your hotel, you can ____set out_________ on your NYC adventure! If it is your first visit to New York, be sure to take some time to __look around____ the city by taking a walk. It can be a great way to get to know the city and experience the New York way of life. Some of the best things about New York can be found by __checking out___ the many diverse neighborhoods full of great food, interesting events, and historical landmarks. Even though New York is famous for its busy streets, you can ___get away_________ from the crowds by visiting Central Park. There you can walk through the trees, sit by the lake, and even get a famous New York City hot dog. Of course, no trip to New York would be complete without visiting the Statue of Liberty. To visit, you need to ____get on__________ a ferry at Battery Park. While crossing the water, you can _____take in________ a wonderful view of the city. Once on Liberty Island, you can walk around the statue, visit the museum, or climb the 377 steps to the top of the Statue of Liberty. It is an incredible experience, but tickets sell out quickly! As you leave New York and your plane ___takes off________, be sure to enjoy the view out the window to get one last look at the city that never sleeps! This month’s Teacher’s Corner explores travel and tourism. This week’s activity asks students to think about their own cities or countries by designing a six-day trip for a visiting tourist. In this activity, students will prepare a travel plan for someone visiting their country or city for the first time. This activity can take place during one class period or across two classes depending on how much time your students need to prepare their travel plans. Print out copies of Appendix 1 Travel Plans. Print enough copies so that each group of two to three students has one to complete. Begin this activity by having the students form groups of two to three students. Have the students work together to brainstorm a six-day travel plan to their country. a. If your students are from a large city, they could plan the entire six-day trip just in their city. If your students are from a smaller city or more rural area, they can plan a regional or nation-wide trip. As the groups work, walk around the room asking groups for details about their trip. Encourage them to be as specific as possible. For example: if they write “stay in a hotel,” instruct them to be more specific: What hotel? Where in the city? What makes that hotel or area of the city interesting? Optional: Depending on time and student levels, this activity can also be a homework assignment. After the groups have finished their travel plans, the homework can challenge the students to use the travel plans to create a poster, a flyer, or even a video where students can show off their six-day travel plans. After the groups have finished their travel plans, give them time to prepare a speaking presentation to the class. a. Instruct the students that for the presentation each student in the group must speak. For example, in a group of three students, each student can present on two days of the trip. b. Note: Depending on students’ level and ability, this presentation part of the activity can be done on a separate day to give the students more time to prepare. Next, have each group come to the front of the class and describe the travel plan they made to the rest of the class. a. For additional speaking practice, encourage the rest of the class to ask questions about the trip. After each group has presented their travel plan, have the class vote on the presentations. Which travel plan was the best? Which was the most adventurous? Which was the most historic? Directions: Plan a six-day trip to your country for a person who has never visited before. Choose a city, region, or the entire country. Include everything, such as what to visit, where to stay, and what to eat! This month’s Teacher’s Corner explores the world of travel and tourism. With travel becoming easier and cheaper all around the world, people who live in popular tourist locations have begun to ask if too much tourism can be a problem. In this week’s activity, students will debate the positives and negatives of tourism. Before class, read the article "Too Much Tourism"and listen to the audio version of the story. On the website, the article has an audio version that can be streamed over the Internet or downloaded and played on a computer in class. Direct students' attention to the board. On the board write the word tourism. Ask the students what the word tourism means. Next, as a check of their understanding, ask the class where in their country is popular for tourism? Then, write the word over in front of the word tourism to create the new word over-tourism. Again ask the students to provide a definition for this word. a. Note: Over-tourism is a recent issue that has gained attention in the news and travel industry. It does not have an exact definition, but as long as students describe a problem of too many visitors to a place, their definition is acceptable. Once again, check the students’ understanding by asking if there are any locations in their country that they think face problems with over-tourism. a. Note: Depending on the level of the students, this question can be asked as a Think, Pair, Share. First have the students think about the question, then have them share their answers with a partner, finally have the pairs of students share their answers with the class. Next, provide each student with a copy of the “Too Much Tourism” article in Appendix 1. Give students time to read the article. a. Note: To provide students more listening practice, have them listen to the article by playing the audio version of the story from the webpage. Finally, as a show of hands, ask the students who thinks limiting tourism is a good idea? Tell the class they will have the opportunity to share their opinions in a debate. Note: For this debate, students will argue for and against tourism. If you teach a large class, you may want to break students into groups and then have these groups form two teams that can debate. Another option for larger classes is for students to volunteer to participate in the debate, while the rest of the class can act as audience and decide which team won. Begin the debate by dividing the class (or a group of students) into two teams. Decide which team will be the For side, which will argue in favor of the topic, and which will be the Against side, which will argue against the theme of the topic. Topic #1: Whether tourism is always good for the local economy, and the economy is more important than too many tourists. Topic #2: Whether too much tourism can harm the local culture of a city. Topic #3: Whether people should travel less. a. Note: If time permits have the students debate all three topics. For large classes, students can take turns debating: one group of students debates one topic, then the next group of students debates the next topic, and so on. Direct the students’ attention to the three debate topics that you have written on the board and tell the students they should prepare their ideas on these topics for the debate. a. Note: For more advanced lessons, assign the debate preparation as homework so students can research the topics and prepare with more details. Once the students are prepared, have the students who are going to debate first come to the front of the class. Have the two teams form lines on opposite ends of the board. Begin the debate by having the first student in line of the For team present his or her argument for one minute. Then the first student from the Against team has one minute to challenge the ideas presented by the For team’s student. After the first students from each team have spoken for a minute, have them move to the back of the line and have the second student in each line more forward. They will now debate against each other. This time the Against student goes first for one minute. The student for the For team then gets to present his or her argument on the topic. Continue until all students have had the opportunity to debate. Remember: An effective debate is not only about presenting an argument but also challenging the argument of one’s opponent. For more information on debates and ideas for using debates in class, check out The Great Mini-Debate on the American English webpage. APPENDIX 1: TOO MUCH TOURISM? Cities – particularly in Europe – are increasingly taking steps against tourists. Venice, Italy, for example, is planning to bar some large passenger ships. Barcelona, Spain, has placed restrictions on apartment rentals. The problem these cities say they are dealing with is "over-tourism" -- too many tourists visiting at once. Jonathan Keates is the chairman of the Venice In Peril Fund, an aid and activist group. He said too many people are crowding the walkways and canals of Venice, interfering in what he calls a “still living city.” Taleb Rifai is the secretary general of the United Nations World Tourism Organization (UNWTO). He spoke recently to tourism ministers at London's World Travel Market. He said the rise of slogans, such as "tourists go home" and "tourists are terrorists," was "a wake-up call." Anger about tourism could continue to grow as more people travel every year. The UNWTO estimates tourists will take 1.8 billion trips by 2030, up from 1.2 billion in 2016. Low-cost airline tickets are helping fuel the growth in tourism numbers, along with increasing travel from China. Yet many places depend on tourism for jobs and wealth. Around 10 percent of the world's gross domestic product, or GDP, comes from tourism. Taleb Rifai said that growth is not "the enemy." But, he said tourism must be made "sustainable and responsible" to help local communities. What are countries and cities doing to limit tourism? Other cities are urging tourists to visit less famous parts of town. Prague, for example, has an "off the beaten track" tourist program. London is promoting neighborhoods such as Greenwich and Richmond. Barcelona has cracked down on unofficial housing rentals and established a tourism council that includes residents, businesses, and unions. Gloria Guevara is the president and CEO of the London-based World Travel & Tourism Council. “There is no one solution for all. Every destination is different,” she said. Tim Fairhurst leads planning and policy at the European Tourism Association. He said businesses do not want to put their customers in places where they are treated as unwelcome. He said simple measures can make a difference, such as changing opening hours or increasing parking space. Pan Pylas wrote this story for the Associated Press. John Russell adapted it for Learning English. Caty Weaver was the editor.